Springtime is one for new beginnings. With that in mind, our April specials offer the possibility of a new apartment home in one of many of our communities. Take a closer look at our featured properties for April. Interested in taking a tour? Contact us today to arrange an in-depth visit! The Villas at Laketown is one of the selected featured properties available this month. When your home features a light-filled sunroom made for relaxing, an in-apartment washer and dryer, and plush carpeting, you’ll find it hard to leave. Crossroads Apartments in Metairie is one of our most conveniently located apartments, set just three blocks south of Veterans Boulevard. That translates to quick and easy access to the best shopping and dining of Metairie – or take a ten-minute drive and find yourself in the heart of New Orleans. Call to find out more about special rates on select units. But – back to the units themselves. Choose from studios, one-bedroom, and two-bedroom apartments to meet your needs: select apartments feature cathedral ceilings while all are outfitted with oversized closets and set within a beautifully landscaped community that features bubbling creeks and winding paths tucked safely behind a censored access gate. We said it before, and we’ll say it again: you’ll find it hard to leave! This River Ridge community offers proximity to New Orleans at a decidedly quieter pace. Find yourself in a peaceful atmosphere peppered with pines and local flora and fauna. You won’t just enjoy the green space and your walk to and from your apartment – on-site amenities like sparkling pools, private patios and balconies, and dedicated grilling stations allow you to experience the beauty of the outdoors each and every day. Sawmill Creek offers a variety of floor plans to meet your needs. Choose a one-bedroom townhouse, a two-bedroom traditional style, or something in between. What’s more, you can choose from bathrooms, too – anywhere from one to 2.5 bathrooms are available. Corporate apartments are available to truly make this lushly appointed community your home away from home. Brand-new apartment homes. Need we say more? We just completed our latest property, Bella Ridge, and its modern touches shine through. From granite countertops to crown molding to separate oversized tubs and showers, Bella Ridge feels like a luxury retreat – one that you get to live in year-round! Other savvy details include a covered parking garage (no more dashing through a rainy day) and an on-site dog park. A sparkling pool with built-in tanning ledges will give you a bronzed, summery, just-back-from vacation look – without the cost of an actual vacation! For April, you could receive up to $175 off your move-in costs plus up to $100 off monthly rent. Size definitely matters when it comes to your apartment. The Villas at Laketown offer vast square footage and contemporary designs – architectural details like arched doorways, for example, are a regal touch. You’ll feel entirely at home as soon as you walk in and experience these apartments. From personal intrusion alarms at the door to wood-burning fireplaces, these townhomes offer all the convenience of a stand-alone home (attached garages included) and then some. These apartments rarely have availability, so we’re pleased to offer openings in addition to reduced rates on select units. 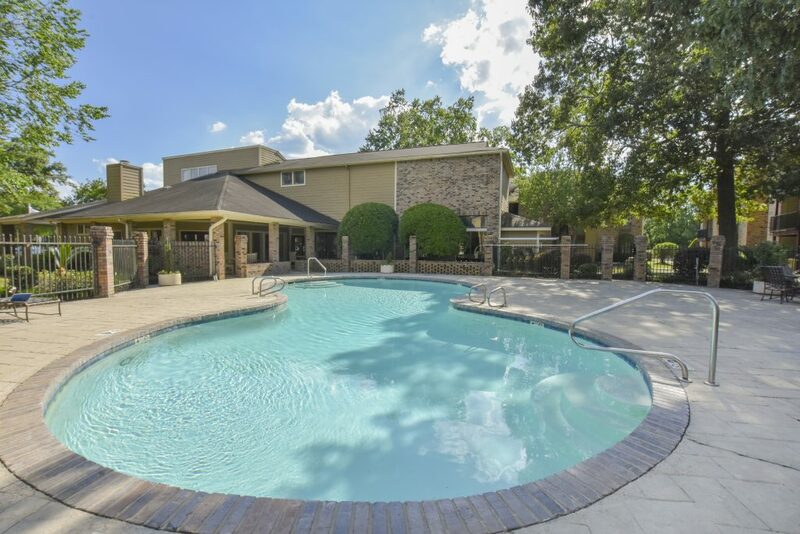 Millstream apartments in Metairie are that rare blend of convenience, space, style. Amenities include meticulously landscaped greenspace (plus a pool) and secure access gates. You’ll live amongst thoughtful interior details like natural brick accent walls, floor-to-ceiling windows, and built-in bookcases and vanities. But it’s hard to keep a home beautiful when it’s not organized – that’s why Millstream features spacious closets with organized shelving. Call us to find out more about special, reduced rents on select units. If the warmer weather hasn’t put a spring in your step, these incredible deals on apartments just might offer the extra pep you need. March into spring with our March Featured Properties, including up to $1,800 in savings at our newest property, Bella Ridge, and up to $50 per month in rent savings at Regency Club. Arbor Gate, Brewster Commons, and Lakes of Chateau Estates South are all part of the mix, too – check out the deals below, and call for more information! 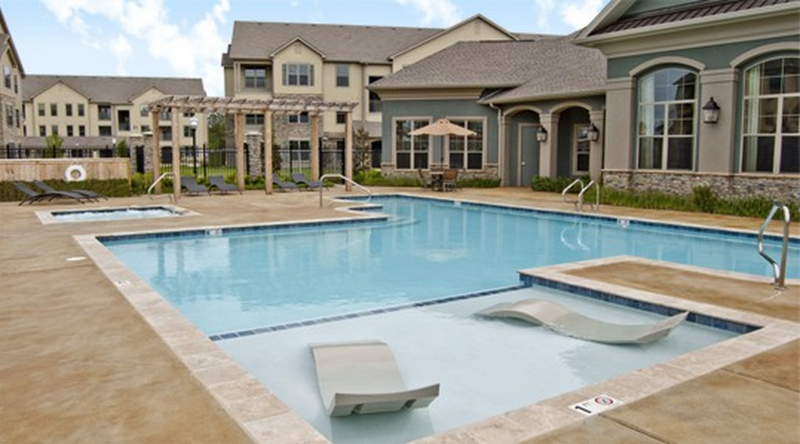 Relax by the pool at Brewster Commons, one of our March featured properties. Bella Ridge – Get up to $1,800 in rent savings for your March move in (more than a month’s free rent on select floor plans!). This gorgeous new property features granite countertops, oval tubs plus a shower, wood-style flooring, kitchen islands, and an attached parking garage. Regency Club – Enjoy up to $50 per month rent reductions and ask how to get 1/2 month free! This offer only applies to a few select units, so don’t miss out: call today. Lakes of Chateau Estates North – Premium finishes such as crown molding, plantation-style blinds, recessed lighting, and double sinks offer a luxury living experience. 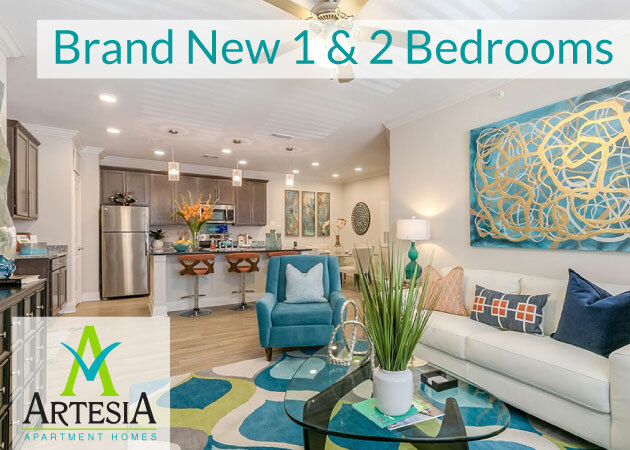 Ask about how you can save on move-in costs at this beautiful property, which also has garage space available for monthly rental. Lakes of Chateau Estates South – This property is full of amenities for outdoor enthusiasts, including walking paths, tennis courts, and a sun-filled swimming pool. 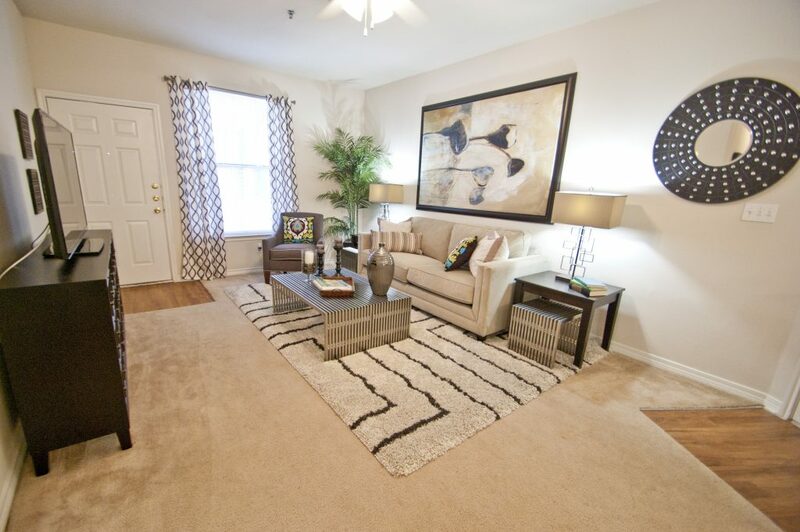 Limited floor plans are available now – call today for more information. Hickory Creek Central – This luxury property in River Ridge features split-level stairs, sunrooms, and patios in select units plus all the comforts of home like a washer/dryer and fireplace. Call now to find out more! Arbor Gate – A full week of free rent plus $100 to put toward decorating are part of this month’s specials – not to mention a $99 deposit special, reduced rates, and reduced initial moving fees with select lease terms. Brewster Commons – Select floor plans and this thoughtfully conceived community are at an all-time low. We’re offering half off your deposit plus waived administrative fees on select units. Grand Palms – Reduced rates and moving specials are part of March’s specials, not to mention a $99 deposit special and waived move-in fees. With two pools, beautiful courtyards, and a playground, this property has lovely amenities for everyone. Clearwater Creek – This River Ridge community is all about the amenities. Beautiful landscaping with fountains and creeks plus a pool provide a tranquil space for outdoor enthusiasts. Call today to find out how to make Clearwater Creek your home. 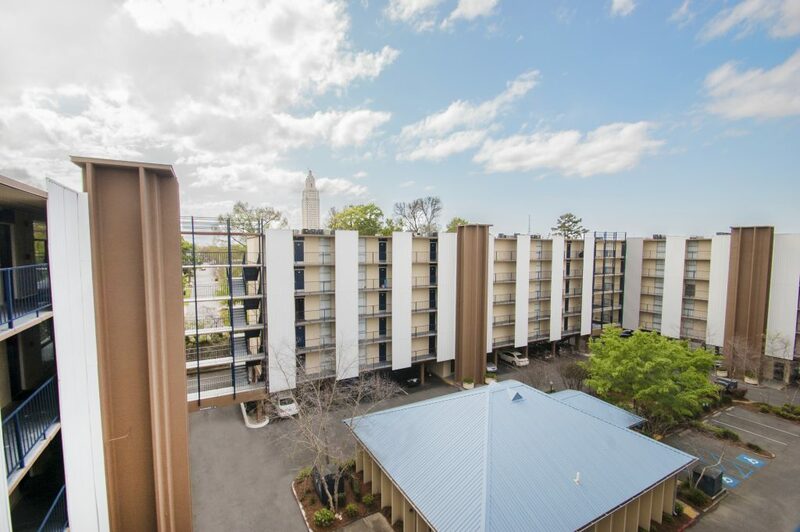 Crossroads – These renovated apartment feature washers and dryers in every single unit in addition to sunrooms that let in gorgeous natural light all year long. A tranquil setting of bubbling creeks and winding paths plus a secure access gate provide ultimate peace of mind. Call for more information.